As a Homeowner or a business owner, you are likely to care greatly about the exterior of your property. As a homeowner, having a good-looking home can make a huge difference to the valuation of your home. As a business owner, the exterior of your business can determine if a customer chooses to come in or not. Regardless of if it is a residential property or a commercial one, there is an inherent value in having a clean, and aesthetically pleasing, exterior — something that can be ruined by broken, discolored, or old siding. At Nice Shingles Roofing & Exteriors we specialize in not only roofing but also in all things siding. Below is a list of siding services that we offer to the Stroudsburg And Poconos areas. The need for siding replacement or completely new siding installation can happen for many reasons. Sometimes siding can become damaged as a result of cracking or warping, but often times siding replacement is used as a feasible alternative to the wooden siding. In recent year vinyl siding has become extremely popular in the Stroudsburg and Poconos areas because of its tremendous durability and curb appeal. Not only does it cost less, but it is also virtually maintenance free. If you want to make the switch to vinyl siding, be sure to contact us at Nice Shingles Roofing & Siding. We offer various types of siding ranging from basic vinyl siding to stone veneer siding. Much like roofing, siding can become damaged as a result of heavy storms and falling branches. When siding becomes damaged it may seem as if you have to replace the totality of the affected well when in reality you might only have to replace a few sheets. If your siding has been damaged please don’t hesitate to contact us at Nice Shingles Roofing & Exteriors to request an inspection and quote. One of our experienced vinyl or stone veneer siding installation technicians will be happy to come out and see what they can do to help. 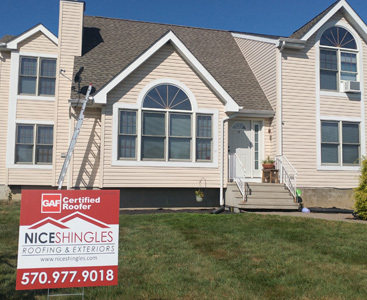 Nice Shingles Roofing & Exteriors is your go-to roofing and siding company in the Stroudsburg and Poconos areas. It is our goal, with any project, to ensure that it is done correctly, swiftly, and with minimal impact to ensure that you can get back to your life as quickly as possible. If you have any questions regarding siding, pricing, or anything else regarding the exterior of your home, we urge you to contact us today.